We were very lucky to have an inspirational speaker, Zaffy Simone, come to talk to us about life and work with autism, and what it's like to grow up on the spectrum. Speech, Sign and Song was featured on BBC1 on 14th November 2013. We featured within 'Daisy's story' in the BBC 'Children in Need Rocks' concert. Roma Seth and Hilary Dalton were interviewed on Radio Nottingham on 1st November 2013. They both spoke eloquently and with great enthusiasm about what we do and why, and the difference it makes to the children. You can listen to the first part of the interview here. And the second half here. We were at the Beeston Carnival in July 2013. We took along Sami the signing puppet, and sold children's musical instruments to raise funds. It was a really really hot day, and by popular request we sang 'I hear Thunder' many times, while spraying the crowd with cool water! On 7th November 2012 we had a very special visitor at Speech, Sign and Song. 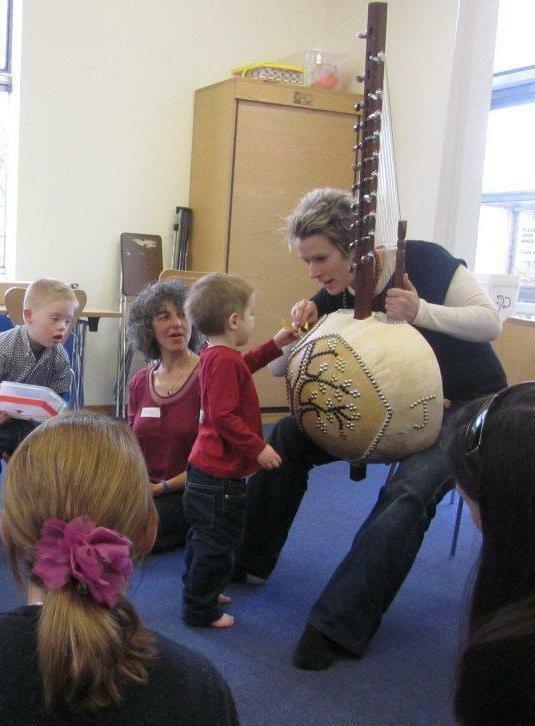 We spent part of our 'multicultural' budget on a kora demonstration by Jude Winwood. The kora is a beautiful African harp. Children and adults alike were totally mesmerised. On Saturday 14th July we took part in the Beeston Carnival with our newest group member, Sami the Signing Puppet! He attracted a lot of attention and we had a great time singing and signing. But the photographer wouldn't let him move his hands for this picture! 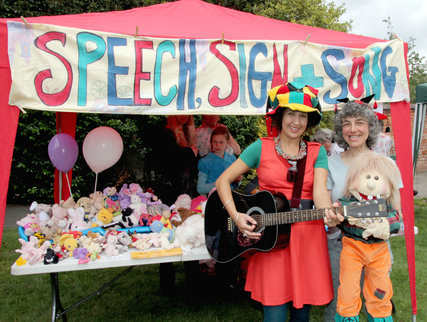 We also sold every single toy that had been donated and raised over £100 for the Speech, Sign and Song Club.